Today’s ride starts out on Highway 126, and much like a sports coat in the 80’s, it has nice wide shoulders. You’ll pass through McKenzie Bridge (the community) and past the Forest Service’s McKenzie Bridge Ranger Station before turning onto Highway 242 at around mile 8. Up until now, the road will have been pretty flat. Once on the Old McKenzie Highway, we start gaining altitude. This climb is pretty much up and up, followed by a little more up, until we reach the summit of the Cascades at Dee Wright Observatory. If you look closely during the switchbacks, there is one spot where you can look down and see at least 3 switchbacks just below. This climb is a gentle incline at 5-6% and you’ve laughed in the face of much tougher hills in your day, so it shouldn’t be overly-difficult. And once you reach the top, have a little rest and a snack and take in the view – you’ve earned it. 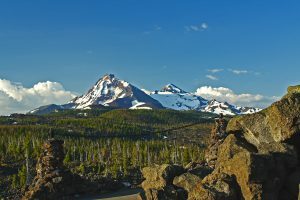 Speaking of the view, from up here you can see lava flows and obsidian on both sides of the road as well as spectacular views of the Three Sisters. 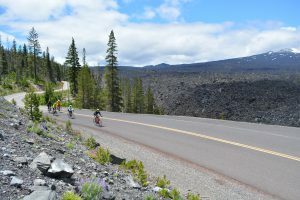 Riders will also experience a unique phenomenon near the summit where they travel through 3 counties in the space of one mile. Between the summit and Sisters, there are 15 switchback-free miles of downhill. There are a few sharp corners and rough road spots to keep an eye out for, but besides that it can be a really fun, speedy descent. At mile 33, you’ll arrive at Windy Point Viewpoint. If the weather is not cooperating, this area can be a little, well, windy. If you’re prone to getting chilly, this would be a good place to add another layer. Lunch will be served in a shady city park in the community of Sisters. From Sisters, it’s only 22.4 mostly flat miles to the finish in Tumalo. 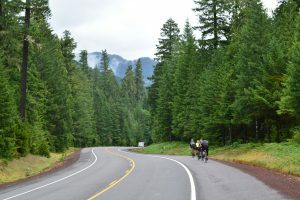 We’ll be riding country roads with very little traffic, (with the exception of a couple of brief segments on Highway 20 and Highway 126) and on the Twin Bridges Scenic Bikeway. *Gravel Option: The gravel option is a sweet 15.4 miles that starts in Sisters and rejoins the main route on Tumalo Reservoir Road. The beginning portion has a bit of loose aggregate but the payoff is spectacular views and relative solitude. Interesting fact: Tumalo Reservoir is perhaps Oregon’s greatest irrigational blunder – the dam was built but giant skink holes and porous bedrock couldn’t hold the water.